My favorite place in this world is on a football field, under the lights, hearing the crowd cheer as the announcer says, "Bbbaaalllooo Stars, yoooooouuu may take the field for cooommmmpetition!" And you all know that's how the announcer says it! Blue Stars is my family and my dream. The thought of it ever being taken away from me just hurts me more than any injury could. This may seem a bit strange, but I wanted to give everyone out there who's helped me in the past a huge thank you. My name is Savahna Sperle, and I am going into my fifth year with the Blue Stars. I am in the contra line. In January of 2005, on my way to our monthly rehearsal camp, I was in a huge accident. I was not the driver, but one of the two backseat passengers. There were four girls in the car and we found ourselves upside-down half buried under the snow. The weather was well below freezing that day, and it was up to me to get the girls and myself out. I had to work very hard to get my door open and unbuckle myself and the girl sitting next to me. Once I did, she couldn't move an inch because of fear. I looked in the window to see that the two girls in the front had been pinned in and the car was starting to smoke. There were no cars to be seen other than ours, and when one did come by, they just chose to stare as they drove by slowly. I tried calling 911 only to learn that there is such a thing as a "non-911 area." So the life of these girls was soon left into my own hands. I wasn't quite sure what to do, so I just started digging the snow away from the doors in the hope I could pull one open and start getting them out. Between the combination of digging in the snow in the cold and pulling on the metal and trying to wave down cars, something had happened. Someone finally stopped to help, but by then, it was too late for myself. I looked at my hands and found them to be swollen, spotted white and red, itchy and burning, and I couldn't move them for my life. Three ambulances, a few police cars, a tow truck and one news crew later at the hospital, I learned that all of the girls had been saved from the accident and were okay. I was the only one injured besides my contra which was in the back of the car. "Third degree frostbite," I remember them saying. "Its very possible you will never feel them again and there isn't anything we can do for you other than 'get rid of them.' Oh, and you tore a few things in your lower back, so don't lift anything heavy!" I'm a contra player, and a very stubborn one at that. I had worked hard for my position in the contra line and it was my dream for two years before I got the spot. But my hands were dead. I couldn't feed myself, dress myself, type or write, let alone hold a horn up and push the valves down, and my back was bad. What was I supposed to do? My dreams quickly slipped out of my hands. Blue Stars saved my life in the past by "bringing me out of my shell," so to say. Prior to joining, I was way too shy and would never talk to anyone. They gave me dreams of becoming a junior high music teacher and taught me what family was when it didn't always seem as if I had one. 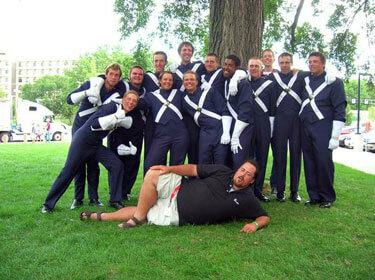 Blue Stars taught me what "fco" meant, "finis coronat opus," translated to "the end crowns your work." Everything you do now will affect what happens in the end. And the end is where the reward is. I had wanted to give back everything I could to them before I aged out. I started marching in 2003 when we were a Division III corps and would not have made it to Division I without everyone's help. Three months went by with me trying to be as stubborn as I could be, hiding my bandaged hands under my mittens each day. I was starving because I wouldn't let others feed me and had a major struggle with depression. I was afraid that I may have lost my chance to march the corps and that my dreams of music were quickly slipping away. I was afraid to let the guys in my line down and afraid to lose my spot. I kept getting calls and e-mails (that my roommate had to open for me), encouraging me to not give up and to keep praying. Now, I can't exactly tell you how it happened, but one morning, when we went to change my bandages, my hands were grey. And as it looked like it couldn't get any worse, I got feeling back. Not full feeling, but there was feeling there. I must admit to you that at times, if they get too cold or too hot, they've been known to go fully numb. The corps staff and my contra brothers weren't ready to give up on me, thank God. And with their help, I pulled through each day and even made it to DCI World Championship Semifinals. I tried hiding my pain and frustration, but couldn't. There were long, hot days in the south with me watering my horn and wearing double gloves. The Blue Stars contra section. My friend Jeff helped make sure I was wearing my back brace each day under my uniform and practice clothes, which was a bit embarrassing. My music tech, Scott Carr, understood what I was going through and knowing that really helped. I can remember days in which we had long walks to the stadium and literally before each show, I had to pray to God that I could hold on just tight enough to carry the horn throughout the show. Sure, I got crazy looks from competitors who possibly thought, "Why is she breaking? Isn't she strong enough to hold that thing?" But you know what? I thank them for that, too. If it wasn't for people helping me along this long ride, encouraging me to push, financially getting me there and even feeding me when I couldn't pick up a fork, my dreams of being under the uniform would have disappeared. God has really shown me what its like to have humility. And I know that I desperately needed to learn that. Thank you to all of you. You've inspired me to carry on the Blue Stars tradition and I hope and pray that one day I can inspire at least one person out there to do the same. 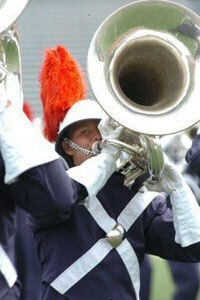 Blue Stars contra/tuba 2005, 2006 and coming to 2007!